Don't let feline eye infections make your cat unhappy or uncomfortable. Learn to identify eye infections in cats early so you can treat them at the first opportunity. Eye infections can arise from chronic or acute illnesses or as the result of injury. Common causes of infections include the following. Any type of tear to the eye tissue results in a breach where bacteria can take hold and multiply. Sometimes the breach results from a scratch, either by accident or received during a fight with another cat. Other times, the breach may be caused by an established infection that has been left untreated and has now damaged the tissue. Conjunctivitis is highly contagious to other felines, and it's incredibly difficult to cure. In many cases, once a virus establishes itself, traces will remain in a cat's system the rest of its life even after physical signs disappear. The virus will then resurface during times of stress and illness. Bacterial infections of the eye typically occur secondary to an injury or viral infection. Bacteria are opportunists that take advantage of a cat's overtaxed immune system and set up housekeeping. Chlamydia is the leading bacterial cause of eye infections in cats. Although humans are also susceptible to chlamydia, people and cats respond to different strains of the bacteria, so it isn't possible for a cat to infect a person, or vice versa. Bacterial infections present virtually the same physical signs as viral infections. Treatment of your cat's eye infections is essential to preserve your cat's eyesight. Vets follow a standard routine for treating eye infections in cats. First, the vet will gently clean away as much discharge and debris as possible to give a clear view of the eye tissue. Next, the vet will carefully examine the corneal tissue to assess damage. Sometimes vets will use a fluorescein stain to detect even the smallest corneal ulcers. If the damage isn't extensive, the vet will typically apply medicated eye drops or Terramycin ointment directly to the eye. This moisturizes, soothes and protects the tissues. The tetracycline in the Terramycin ointment fights bacteria, so it's also useful for staving off secondary bacterial infections when viral infections are present. If the eye has sustained significant injury, a surgical repair may be necessary. Pet owners can provide follow up care at home. Gently cleanse away discharge with a warm wet cloth: It's important to fold the cloth over after cleaning the first eye in order not to transfer germs to the second eye. A fresh cloth should be used for every cleaning session. Continue to apply medication: Eye drops and ointments are typically prescribed for a seven to ten day course, so at-home applications are necessary to provide continued protection to the tissues until the infection has abated. Keep bedding, food dishes, and toys scrupulously clean: Some of the viruses that cause eye infections are not only highly infectious, they also survive for a very long time in the environment. Eliminating them on a routine basis lessens the chance of contagion to other cats in the home. Of course, many feline eye infections can be prevented by having your cat properly vaccinated against the viruses that cause them. Kittens should receive an initial series of three vaccinations beginning at the age of six weeks and receive a yearly booster each year after that to ensure continued immunity. Infections from injuries can also be avoided by keeping your cat indoors and away from other felines. 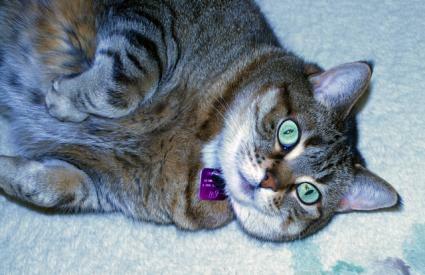 A healthy cat's eyes should be completely clear and slightly luminescent. Tissues should be free of any signs of inflammation without bluish-tinted scars across any portion. Review the basic anatomy of a cat's eye in order to understand how eye infections can take hold. The cornea: This is the clear covering that protects the outer eye. Although it's transparent, it has about seven layers so it does provide some protection to these delicate organs. The schlera: This is the white of your cat's eyes. The conjunctiva: This is the pink connective tissue that is attached to your cat's eye lids and whites. The third eye lid: Not immediately visible under normal circumstances, the third eye lid is a very thin layer that covers most of the outer eye. As with most medical problems, early detection and treatment usually result in a quicker recovery, so if you suspect your cat is developing an eye infection, see your vet right away.